Bryan Hauger Consulting Film Blog September 2017 - Bryan Hauger Consulting, Inc.
Seal failures are a serious and common problem in flexible packaging. A common failure area is the perimeter adjacent to the seal. It is not unusual for this perimeter to be 10% to 50% thinner than the film's nominal gauge. When stressed under gauge film yields to failure. Polymer, process variables (temperature, pressure, and dwell), as well as the radius of the sealing head and thickness of the sealant layer contribute to reduce or increase the degree of squeeze out and thinning. 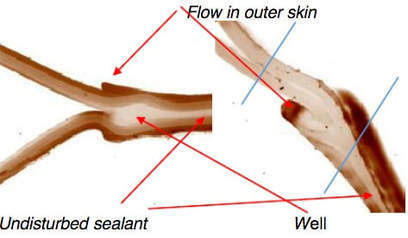 The purpose of this note is to illustrate how each of these factors contribute to preventing seal failure due to thinning related to sealant squeeze out. Check out the entirety of the paper here!